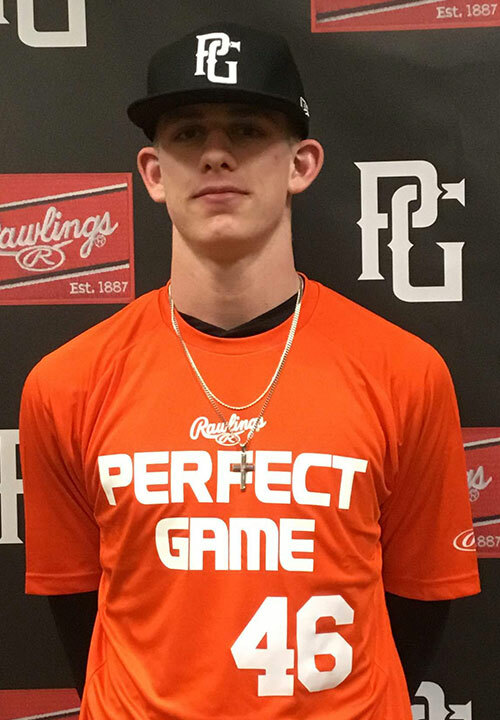 Dylan Lesko is a 2022 RHP/C/SS with a 6-3 170 lb. frame from Buford, GA who attends Buford HS. Extra large frame with a tall and athletic build. Ran a 7.47 sixty yard dash. Showed a smooth fluid delivery on the mound with a short arm action from a three-quarters arm slot. Utilizes lower half well, really drives off his backside. Fastball topped at 90 miles per hour with a good downward plane and late life. Showed a tight sweeping slider and a change-up with late downward movement. Has present ability to throw all 3 pitches for a strike. Very impressive outing with a lot of room for continued development on the mound. Right handed hitter at the plate. Straight up stance with a wide base. Hanging load with good weight transfer and some lift in his swing. Uses a middle to pull side approach and shows some present strength. Also worked out at catcher where he showed very good footwork coming out. Utilizes a quick arm and transfer along with good arm strength and accuracy topping out at 81 miles per hour and posting a 1.79 pop time. In the infield he showed an out front funnel with sound footwork and very smooth actions. Named to the 2018 National Underclass Main Event Top Prospect List. Excellent Student.